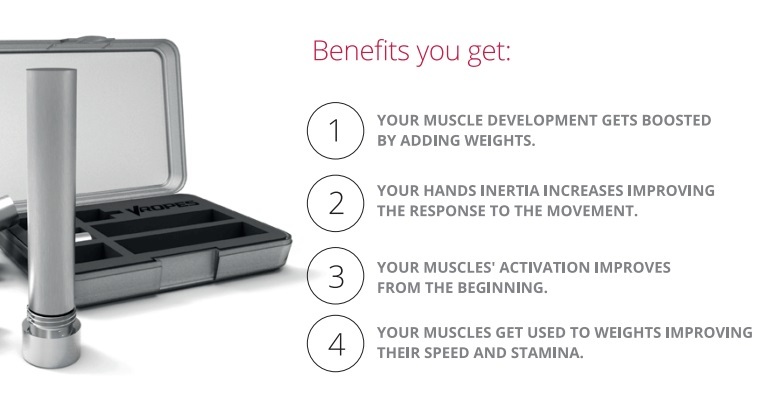 How many movements can you think of which simultaneously improve speed, coordination, endurance and strength? Clean and jerk? Rowing and burpees? Alright, but what if all you’ve got to work with is a jump rope, a few hundred grams, and maybe access to a bike every now and then? We all saw weighted jump ropes at the 2016 CrossFit Games, and ever since introducing weights to the Velites Fire 2.0 (which you could do way before then, by the way!) 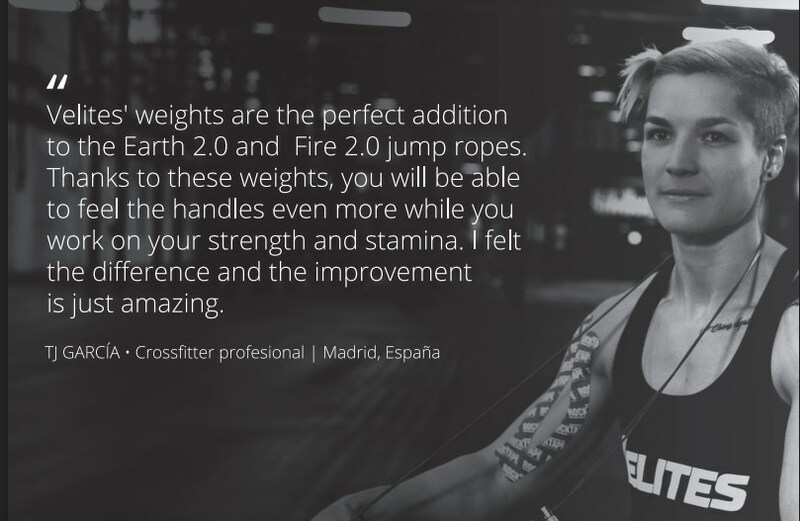 we’ve had nothing but positive feedback from athletes and CrossFit boxes across Europe. If you’re packing light or working at a home, there is no better way of increasing strength and improving coordination, endurance and speed, than to get after it with a weighted jump rope. To help you get started with your own weighted jump rope, we’ve designed a full workout programme designed to test and then push your limits. The Fire 2.0 is a fierce jump rope on its own; we call it the world’s fastest competitive jump rope. Add some of our very own weights to the handles and switch out the regular cable for a thick one, and you’re in for a totally new experience. Forces you to work harder, improving cardiovascular conditioning. 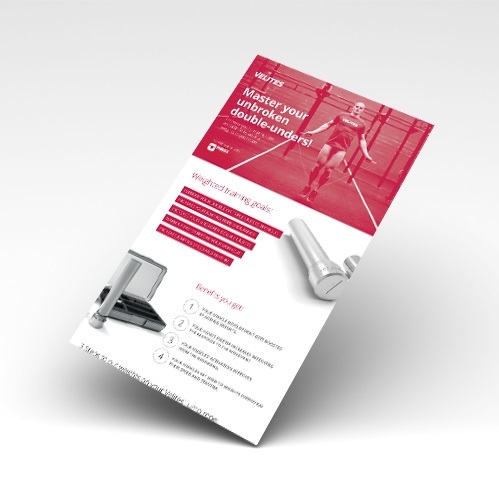 This free Velites infographic contains everything you’ll need to get started with your weighted jump rope, including workouts combining running, burpees, rowing and cycling. Don’t have access to a bike or rower? No problem. The jump rope is the focus here anyway; simply switch out the bike or rower for another movement. The important thing is to go hard. You set your own limits. We highly recommend this programme as a supplement for CrossFitters, cyclists, rowers and runners. Tip: Weighted jump rope can be tricky. Don’t sacrifice technique and safety for speed and reps. Get good reps and remember that quality is worth more than quantity. There are five main points we want to touch on here, to explain why training with a weighted jump rope can be so valuable. Force — The more force you can train your body to exert, the more powerful and explosive you’ll be in the rest of your training. Resistance — Put your body under more pressure for longer, and over time you’ll improve your muscular endurance and aerobic capacity. Speed — You’ll naturally move slower with a weighted rope, but once you go back to a regular rope in workouts, you’ll be flying. Range of motion — Efficiency is key to jumping well with a weighted rope, so you’ll develop a more full range of motion the more you practice. Coordination — Similarly, you’ll learn to be more in touch with what your body is doing, which will transfer well into other areas of your training. We mention CrossFit all the time, but really, training with a weighted rope is fantastic whatever your sport — training with a weighted jump rope might be all you do, in fact! Cyclists, runners, rowers, climbers, martial artists, all of you guys can benefit from getting outside your comfort zone and training with a weighted jump rope. Go and check out the infographic, give a try for a week, and we promise you’ll notice a huge difference in your speed, strength, coordination and endurance.